We often associate Mindfulness with sitting still or meditating. But in fact there are many ways to be mindful. Walking, in my opinion, is one of the best. Mindful walking can be incredibly beneficial. We often undertake a brief walking meditation during our teaching sessions. During this time we encourage group members to be aware of their bodies and their breathing. Like all Mindfulness exercise the emphasis is on awareness. Quite often, people find that walking like this is a completely different experience. Often in our lives we are on auto-pilot taking much for granted. We are seldom fully aware of the movement of our bodies as we undertake a task. The experience can be quite enlightening. It’s arguably easier to be aware of your body walking than when sitting. And just in case we think walking is such a simple thing it’s worth remembering that despite much effort scientists haven’t yet been able to get robots to walk well on two legs. A surprising amount of skill is needed to get a person up walking straight. Most of the time when we walk we have a place to get to and our goal colours our experience. What a change just to walk for the sake of walking! The aim is to have no other intention except awareness. We may notice details in the environment we hadn’t seen before. We may notice tensions, aches and pains within our bodies. And we may either enjoy or dislike the walk. Whatever we feel – cold, wet, exhausted, happy or full or energy -all is ok.
We’re trying to experience being. And whatever is is okay. With our full awareness on the experience we may notice things we wouldn’t usually. The feel of our feet against the surface we walk on. Our balance. The air against our skin. The sounds all around us. We may find ourselves observing colours are sharper, skies more beautiful, the clouds prettier, the trees more majestic. We may notice there are birds in the sky. And don’t forget the body. What sensations are there in the soles of our feet? Can you feel your arms swinging by your sides? Do you notice when your walking pace changes? The famous Mindful teacher Thich Nhat Hanh recommends walking and smiling because it generates positive feelings. Not just to yourself, but to others as well. Recent studies back this up. If we act happy we often become happy. Reason enough to walk like a crazy, happy, mad person. Walking is a great act. An act not everyone is able to undertake. An act of defiance. A strike for freedom. Each step is a step for peace bringing you in contact with the earth. Take in the beauty around you. What other life or movement is there? Trees, flowers, lakes, streams? Keep breathing. Imagine each step refreshing your body, pumping energy into you. Moreover, we don’t need special walks just to appreciate the act. Everyday we walk to so many places? Up and down the stairs. To and from the kettle. To the car, to the steps. 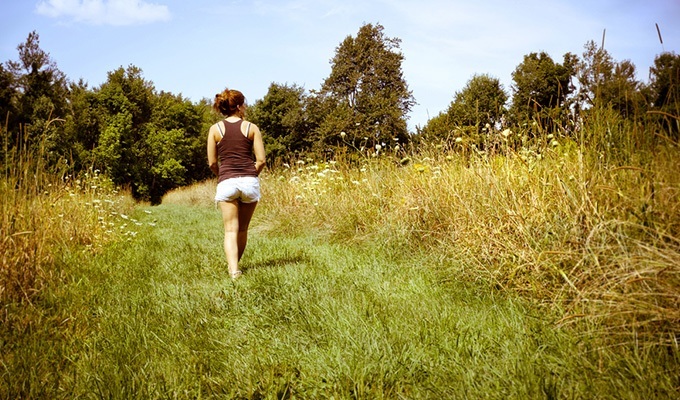 There are ample opportunities to practice mindful walking. So while having full awareness on the body and your surroundings is not practical all the time, the odd reminder that you’re alive, that you can walk, that you are a miracle of existence is beneficial. A moment to let go of any worries. A moment to forget anxiety and to ‘be’. Mindful Walking is exercise for the body and soul and most people report feeling better for it.